Is MarketAxess Holdings Inc. (NASDAQ:MKTX) a Good Stock to Buy? MarketAxess Holdings Inc. (NASDAQ:MKTX) was in 13 hedge funds’ portfolios at the end of September. MKTX investors should be aware of an increase in support from the world’s most elite money managers lately as there were 11 hedge funds in our database with MKTX holdings at the end of the previous quarter. Even though the company has seen increased enthusiasm from smart money investors in recent period, the number of shareholders wasn’t enough for it to be placed among 30 most popular stocks among hedge funds in Q3 of 2018. In today’s marketplace there are a lot of formulas market participants can use to appraise their stock investments. A pair of the most underrated formulas are hedge fund and insider trading sentiment. We have shown that, historically, those who follow the top picks of the top hedge fund managers can outperform the broader indices by a superb amount (see the details here). “Long MarketAxess (MKTX) – Update: We have owned MarketAxess, the dominant “exchange” for corporate bond trading, since inception of the strategy – and have followed the company for many years prior. The qualitative story has always been compelling: ~80%6 of all electronically-traded (vs. voice/phone) corporate bonds trade on MKTX’s platform. Yet, only ~20% of the corporate bond market trades electronically today. These factors create a powerful dynamic for MKTX: a dominant position in an industry with real network effects, a long run-way, and a clear secular trend. While this is exciting, nothing is ever that easy: valuation has always appeared expensive. We’ve been happy to sit tight as shareholders, as valuation crept higher, given our view of MKTX as a “Core” position for the long-run. Nonetheless, at some point, worries about competitive pressures and/or other issues were bound to impact the stock. That has happened YTD, as MKTX fell 12% through the end of Q3. Despite Upslope Capital Management’s optimism, we still need more analysis, which is why we’re going to view the fresh hedge fund action encompassing the stock. How are hedge funds trading MarketAxess Holdings Inc. (NASDAQ:MKTX)? Heading into the fourth quarter of 2018, a total of 13 of the hedge funds tracked by Insider Monkey were long this stock, a change of 18% from the previous quarter. 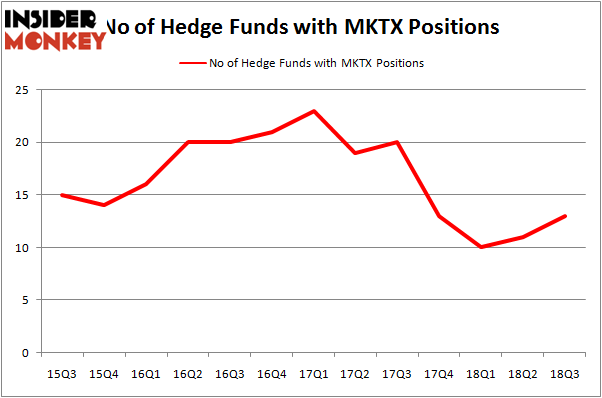 Below, you can check out the change in hedge fund sentiment towards MKTX over the last 13 quarters. With hedgies’ capital changing hands, there exists a few notable hedge fund managers who were boosting their holdings significantly (or already accumulated large positions). 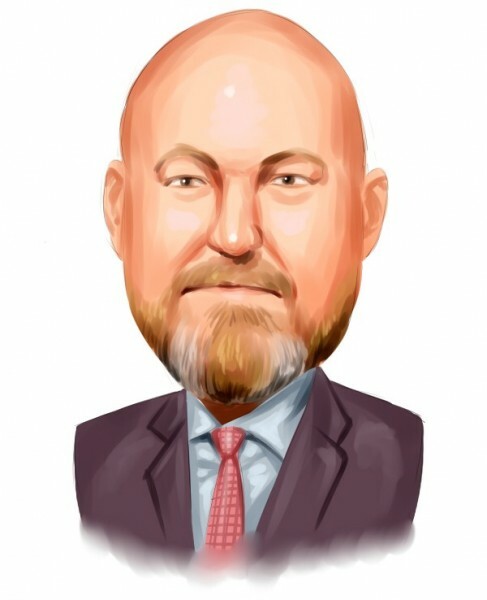 Of the funds tracked by Insider Monkey, Renaissance Technologies, managed by Jim Simons, holds the most valuable position in MarketAxess Holdings Inc. (NASDAQ:MKTX). Renaissance Technologies has a $57.5 million position in the stock, comprising 0.1% of its 13F portfolio. The second largest stake is held by Arrowstreet Capital, led by Peter Rathjens, Bruce Clarke and John Campbell, holding a $50.2 million position; the fund has 0.1% of its 13F portfolio invested in the stock. Remaining peers that hold long positions comprise Marcelo Desio’s Lucha Capital Management, Chuck Royce’s Royce & Associates and Cliff Asness’ AQR Capital Management. As aggregate interest increased, key money managers were leading the bulls’ herd. Holocene Advisors, managed by Brandon Haley, initiated the largest position in MarketAxess Holdings Inc. (NASDAQ:MKTX). Holocene Advisors had $1.2 million invested in the company at the end of the quarter. Thomas Rigo’s Bishop Rock Capital also initiated a $0.5 million position during the quarter. The only other fund with a brand new MKTX position is Mike Vranos’s Ellington. Let’s now take a look at hedge fund activity in other stocks similar to MarketAxess Holdings Inc. (NASDAQ:MKTX). We will take a look at AptarGroup, Inc. (NYSE:ATR), US Foods Holding Corp. (NYSE:USFD), Cullen/Frost Bankers, Inc. (NYSE:CFR), and Erie Indemnity Company (NASDAQ:ERIE). All of these stocks’ market caps are closest to MKTX’s market cap. As you can see these stocks had an average of 20 hedge funds with bullish positions and the average amount invested in these stocks was $372 million. That figure was $149 million in MKTX’s case. US Foods Holding Corp. (NYSE:USFD) is the most popular stock in this table. On the other hand AptarGroup, Inc. (NYSE:ATR) is the least popular one with only 13 bullish hedge fund positions. Compared to these stocks MarketAxess Holdings Inc. (NASDAQ:MKTX) is even less popular than ATR. Considering that hedge funds aren’t fond of this stock in relation to other companies analyzed in this article, it may be a good idea to analyze it in detail and understand why the smart money isn’t behind this stock. This isn’t necessarily bad news. Although it is possible that hedge funds may think the stock is overpriced and view the stock as a short candidate, they may not be very familiar with the bullish thesis. In either case more research is warranted.